Supplementary material reads: "Photo assignment for Manday [sic] May 2 at 1:30 p.m. Please go to El Segundo High School, 640 Main St., El Segundo, inquire at the main office of the school for Patton McNaughton, director of instrumental music. 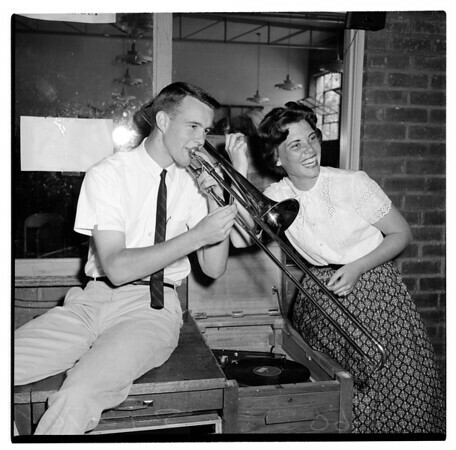 You will be taken to the music department for pix of McNaughton, Doug Lawrence, student, and Darlene Williams, student soloist, listening to phonograph record. Thanks, Kim Blair".